The Big Green Egg Table is the product that brought JJGeorge to life. After purchasing our first Big Green Egg in the fall of 2009 we knew that we needed something more substantial than the nest that it came in with a couple of small trays attached to the sides of our large Egg. We spent a good bit of time searching the Internet for where to buy a Big Green Egg table with little luck. We also spent time looking at the expensive tables that the local Green Egg dealers were selling. Most of the grill tables that we found were mass-produced with a nail gun and cheap lumber. I thought to myself that I need an outdoor grill table made out of lumber and hardware that can stand up to the elements, as well as handle the weight of a one hundred plus pound grill rolling around in it for years. So we sought out to build the best Big Green Egg table on the market! When deciding on lumber, there was no doubt that locally grown eastern red cedar was the wood of choice for a bulletproof table. Not only is the eastern red cedar strong enough to handle a 100-pound flaming Big Green Egg, but we also knew that it would stand the test of time out in the elements. Here in North Alabama and around the Southeastern United States, eastern red cedar was used for centuries on cedar shake roofs and siding on houses because it weathers great and does not rot. It is also very common to walk up on an old fence line in the forest where the barbwire has long been rusted and gone, but still remaining are the eastern red cedar fence posts that have been standing there for 60-80 years. To boot, the cedar looks beautiful, smells great and it is a natural deterrent to bugs. On top of the cedar we apply three coats of clear gloss spar-urethane to every Big Green Egg Table we have for sale. This not only provides the beautiful sheen, but also makes cleaning up grilling messes a breeze. No one wants to ruin an unfinished grill table by setting at dirty grill grate or greasy plate setter on it! That is why we finish them all. Pushing and pulling the weight of a large kamado grill for years will cause a nailed or braded together table to become wobbly and rickety. For that reason, when assembling our Big Green Egg tables we decided to use all weatherproof bolts and screws verses nails or brads. We combine wood glue with the screws to provide a bond that is second to none. Over the years we have tried a variety of different wheel and caster options. It may be overkill but we have settled in on four industrial 3” locking swivel casters on all of our grill tables. These casters are able to move the cart with ease, even under a heavy load. They are also durable enough to roll across a yard, deck, or uneven patio without having to worry about damaging the casters or bottom of your table. When your Big Green Egg cart is idle, all four of the industrial casters will lock into place. We sell our Big Green Egg tables in a variety of shapes and sizes for different grill manufacturers, as well as to accommodate your patio, deck, or wherever else you choose to use and store your grill. Shipping on all of our tables is always free! Grill tables can be purchased for Big Green Egg®, Kamado Joe®, Primo®, and Grill Dome® grills. Our long tables for large grills are 55” long, providing ample workspace while cooking for large groups and plenty of storage for grilling utensils and accessories. The compact version of our table is 44” long and is built for the BBQ chef with a smaller patio, deck, or storage area. There is still ample room for grilling trays and prep work on the tabletop, and the shelf will accommodate all of your utensils and accessories. We also build and stock grill tables that are harder to find than the standard models. Such as our Medium Big Green Egg Table, XL Big Green Egg table, Big Joe Table, XL Oval 400 Primo table, Large Oval Primo 300 table, and more. Most of the time we have these tables in stock, but if not, we can always build them in three to four weeks. 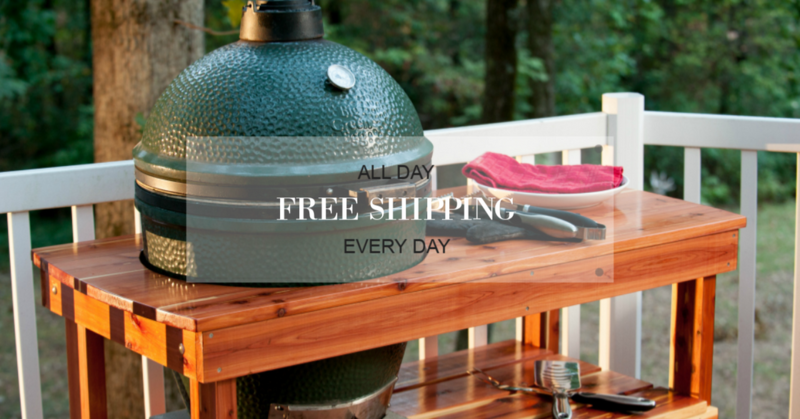 One of the most common questions that we hear at JJGeorge is: How do I put my Big Green Egg into a table? It is a very good question, as most of the popular ceramic grills weigh between 100 – 150 pounds. Step 1: You need two strong guys with healthy backs. Putting a Big Green Egg in a table is a two-man job. You don’t have to be a weightlifter to do it, but it really helps to have some extra horsepower when lifting and setting the grill into place. Step 2: Make your Big Green Egg as light as possible. Remove the cap from your grills chimney (Daisy Wheel, Chimney Cap, porcelain cap, etc….). Remove all charcoal and all of the internal components of the egg including the ceramic firebox. The firebox for a Large Big Green Egg weighs over 40 pounds by itself. It comes out in two pieces and is usually pretty messy, but it is well worth it to drop the weight. If the grill is still too heavy after removing the firebox, don’t over do it. Bring in more help if needed. Also, the lid of the egg can be taken off to drop a significant amount of weight…. When dealing with an XL Big Green Egg, Big Joe Kamado Joe, or Primo XL oval 400, we recommend taking the lid off, or if new, assembling it in the table. Step 3: Assemble your grill table completely. Make sure that your casters are all locked and put your table nest or 16’ X 16” concrete paver in place directly under the opening that the Big Green Egg fits into. If you plan on using your Kamado Grill and table on an elevated surface, such as a deck or raised patio, I suggest moving the table and egg where it needs to be before putting it into table. Hint: Open lower vent of your Big Green Egg to the wide-open position. This can be used as a handle for lifting. Also, place a towel or small blanket on your tabletop so you can rest egg on it if needed. Step 4: With Big Green Egg close to table and lid closed stand facing each other on either side of your grill. Bear hug grill under hinge from each side. One person can use vent as handle. Gently lift egg and set on tabletop with handle facing the side. It is easy to spin the grill once inside the table, so don’t worry about setting in table with handle facing forward. Reposition grip so that both guys are bear hugging Green Egg under hinge (do not use vent for this part because your hand can get smashed). With firm grip from either side of table, gently lower Big Green Egg into hole in table. Step 5: Rotate handle of Big Green Egg to front of table and make sure that there is no contact on the side of your egg where the tabletop meets the hole. Replace your firebox and chimney cap and get ready to grill! Warning! To prevent damage to your table or fire, JJGeorge recommends that all grill tables have a 16” X 16” concrete paver or table nest placed under your grill. This will extend the life of your Big Green Egg table and protect it from the heat that radiates from the bottom of your ceramic grill while in use. Concrete pavers work great, look great, and are inexpensive. You can purchase them from most any hardware store for around $4.00.